Have I mentioned before that I love celebrating Eid? Even more so now that I have a growing family. There is nothing like the anticipation of opening presents, devouring sweet treats and wearing brand new clothes when you have a two year old. It makes holidays even more special, more magical than they already are. Eid al Adha is all about that and more. It is a time when millions of Muslims gather each year- different cultures, different races, different nationalities. Yet, all dressed in white representing human equality. They all perform rituals that culminate on Eid al Adha, the Feast of Sacrifice, in Mecca. Maryam was extra excited this year as she got to 'choose' what outfit she would wear. She is going through an independent phase where she wants to 'choose' everything from her clothes to her food, to what spoon she eats with. And as with any celebration, food is an important part of this festival in my home- it bonds our families, it drives conversation and camaraderie, it creates unforgettable memories. Food brings us all together on this day and lunch menus generally consist of biryani and sweet vermicelli, jalebis and samosas. Sweet bites such as cookies, chocolate bars and cakes are also prepared as nibbles for visiting relatives. And Eid isn’t the same without presents- Maryam ravenously tore through layers of wrapping paper to get to her treasures. This year, I’m inviting you to my home to celebrate Eid al Adha. 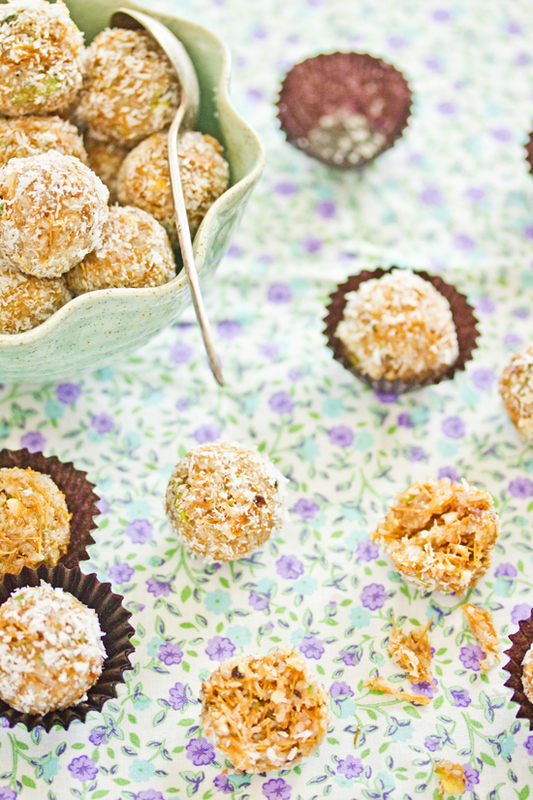 Come take a peek into my kitchen as I prepare sweet treats eaten during this festival. I’m making truffles with a difference- sweetened vermicelli paired with chopped almonds and pistachios. 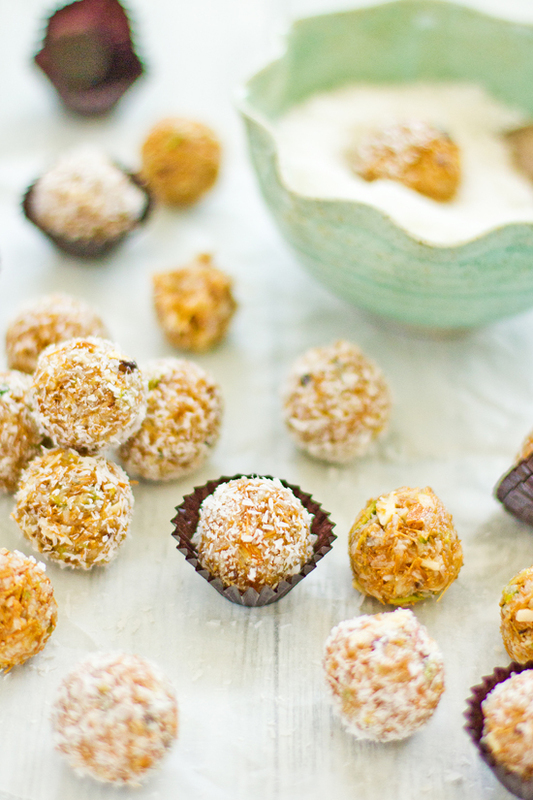 Add some fluffy coconut to the mix and you have an eclectic truffle. 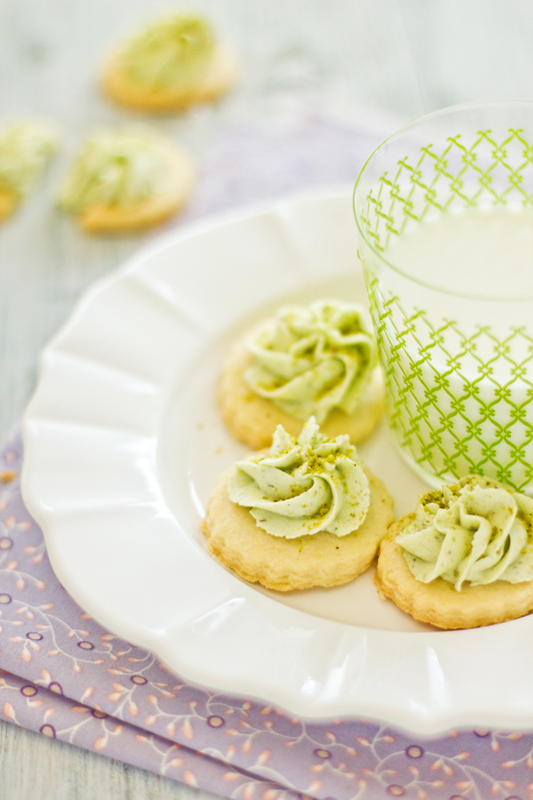 And then these buttery and crunchy pistachio cookies with pistachio butter cream.- melt in your mouth perfection. I was so thrilled to contribute recipes for both these nibbles to the latest Holiday issue of House of Fifty magazine. 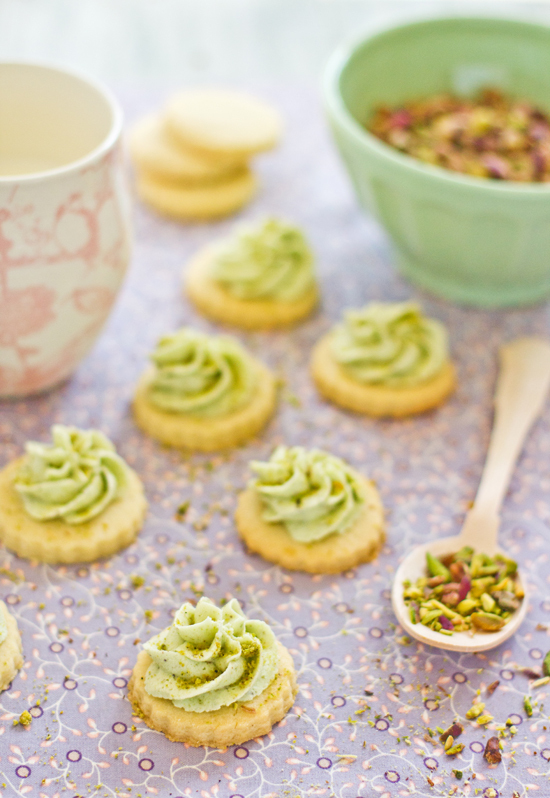 You can find my work, more photos and the recipe for the Pistachio cookies on page 118 onwards. It's also been one year since this blog was born and so I have double reason to celebrate. 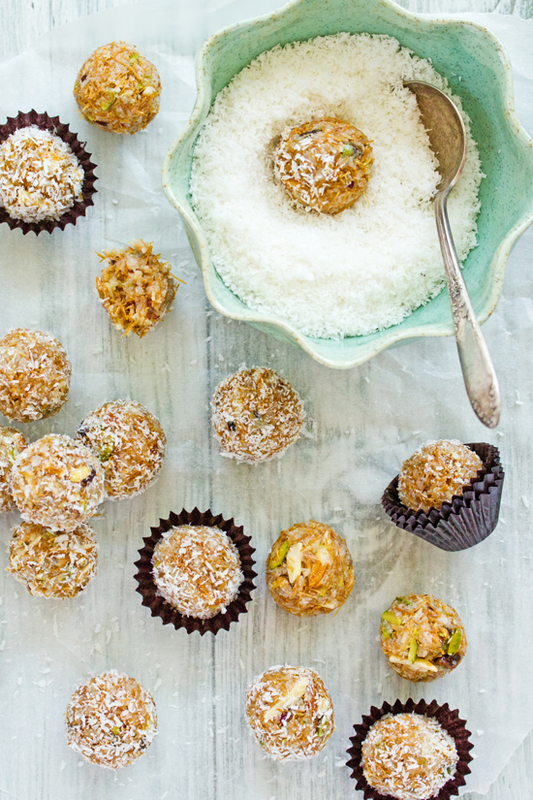 In the meantime, I leave you with the recipe for vermicelli truffles and a wonderful giveaway to mark the one year blog anniversary. Kenwood sent me their latest True Blender BL480 and besides using the metal lined grinding mill to chop almonds and pistachios to make these truffles, I have also been using the blender to make fluffy pancakes. The blades are wonderfully sharp and it even has an ice chopping function. With a baby on the way, I can't wait to experiment with new baby foods using the BL480. Note: Please leave a separate comment for each of your entries or else they will not count. Please leave a valid email so you can be contacted. The giveaway will run until midnight on Monday 21st November 2011. A winner will be announced on Tuesday 22nd November 2011. Giveaway is open to Middle East and Africa residents. Product provided by Kenwood Middle East but all views expressed above are my own and I have not been paid to do this review. Melt butter in a pan and fry the vermicelli until brown and cooked. Use a wooden spoon to keep stirring and breaking the vermicelli as you don’t want it too brown too quickly. Take the mixture off the heat and let it cool before adding all the rest of the ingredients. Stir well. Use your hands to shape the mixture into 1inch balls. Roll in desiccated coconut before serving. Note: Press the mixture between your hands to form a ball. If it is still difficult to make the truffle, you can add more condensed milk to the mixture o help form the truffles. Makes approximately 28-30 truffles depending on size. Happy Eid and blogiversary! Long life to your lovely blog. Eid Mubarak! You Eid sweets looks amazing! Eid Mubarak! I'm a new subscriber and I've been loving your blog. Eid Mubarak! I LOVE these ideas. They could be for any time of year really couldn't they? Oh my...these truffles sound amazing!I have never seen vermicelli used in this way, yum! oh my this all looks delicious, those cookies and the vermicelli balls, which are a new to me way of using vermicelli noodles. Happy blogiversary and Eid Mubarak sounds like a wonderful time of year! 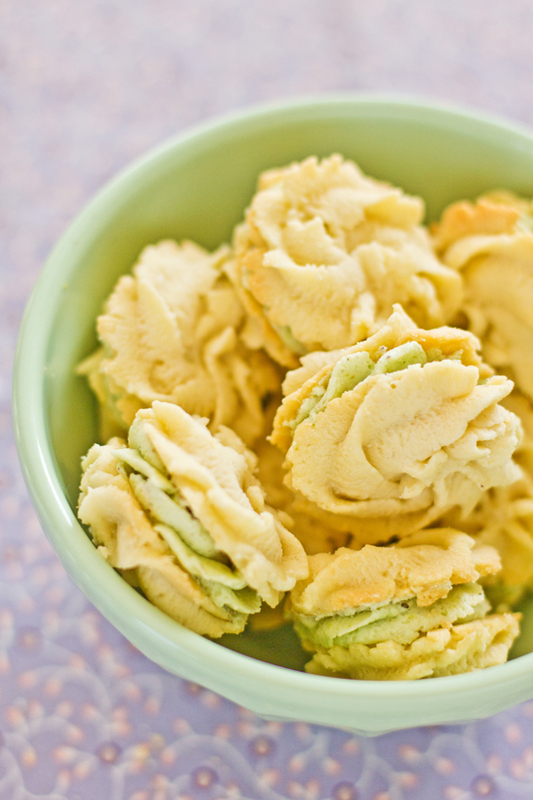 Looks yummy, never heard of using noodles while baking, will definitely try when I get the chance. Happy Eid Mubarak! How I wish I am in the vicinity... I could swing by to have a taste of these gorgeous sweet treat. Happy Eid and congrats on your blogiversary! Thanks Sukaina for capturing the true spirit of eid so beautifully. Its the same in our house- lots of good food, new clothes, presents, friends and relatives, and of course a delicious assortment of aromas- courtesy mom's cooking- drifting out of the kitchen. Good times. Wishing you good luck with your 2-year old Maryam, 1-year old blog and the to be born special one. they look amazing.. so tempting.. but where is the recipe of the cookies?? Eid Mubarak my dear. And happy blog anniversary. Congrats on the blog anniversary..the truffles look gorgeous. I am already following you on twitter. Following Kenwood on twitter @vegtastebuds. Thank you Sukaina for teaching me about this festival. It sounds like such a wonderful family time. I can see why you love it so much. Congratulations on the magazine feature! You are one talented woman and I am so glad that so many people are recognising that. As for the truffles, they look amazing. I had no idea they contained vermicelli!!! They look so delicious. Eid Mubarak to you and your family. Loved the truffles and it was quite difficult to recognize the contents. I follow you on Twitter (@ziziadventures). I tweeted the sentence on Twitter. I liked Sips and Spoonfuls on Facebook (long time ago! :)). I subsribed Sips and Spoonfuls by email before. Hope you had great Eid too ...these beauties looks so fab .. I am already a subscriber. The truffles look great! Love the color on that pistachio buttercream. You can never go wrong with pistachios! reading through your posts and feeding on your beautiful light airy photographs uplifts me. happy Eid to you and yours Sukaina and congrats on the feature! A big Congratulation of the milestone. You blog is a delight. Congratulations on one year of blogging and the great feature in House of Fifty, it looks amazing! You seriously need to teach me how to pipe, those butter cookies are perfect. Happy Eid and BIGGG congratulations on completing one year!!! Such a lovely milestone & a pleasure to know you and read your blog. Congrats on the mag feature- everything looks so delectable..wish I could pick up few from the screen. The light in the pictures is beautiful! Hope to see your work in many years to come my friend!! Already follow on Twitter (@squirrelbread). Liked sips and spoonfuls on FB. Eid mubarak! 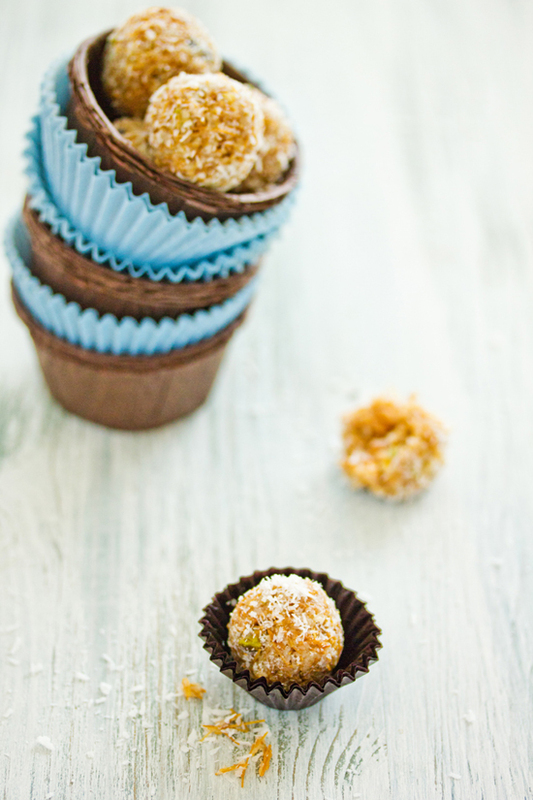 lovely coconut and vermicelli truffles.. i've never put vermicelli in a truffle! I follow u on twitter as betit19! Have an amazing day! Richa @ betit19 at yahoo. Happy blogaversary! ;) Your pictures keep getting better! You´re amazing!!! Love those truffles too! I read ur posts regularly and always thought u have an amazing blog. just disappointed to see the conditions of the give away , I feel anybody should follow u in twitter or like ur face book page -if they genuinely like it rather than u offer them a blender in return.I have seen the trend in many blogs .Is it not just a camouflage to get more followers ? Moreover -asking to like u /follow u -I feel u r losing respect-atleast in my eyes . I must say, I still like ur blog and ur recepies are brilliant. You know you deserve all the these and more and I'm always so happy to see your work :-) Congratulations. I already like kenwood on facebook! And now I follow them on twitter! I have subscribed to Sips and Spoonfuls by Email. Eid Mubarak to you and your family. Congratulations on your blog birthday. I love your delightful blog. Thank you for this amazing givieaway. Love the idea of these truffles!! Eid Mubarak Sukaina!! Love the blog, this post. I am finding a lot of blogs thank's to Kusum from Journey Kitchen's tweets. Look at all these incredible treats. Such gorgeous shots. I'm not eligible but happy blogiversery! Congratulation on the magazine feature and the blog anniversary. You have a truly fabulous space with captivating photography and recipes. A delight to visit, always. Now, I'm following kenwood on fb and twitter too. And finally, subsrcibed to your posts via email. Ah. Eid Mubarak!! I love your blog so much mashAllah! Already following you on twitter,dear. ive been reading ure blog for a while, and i love what u do! Happy...everything! What a wonderful celebration... but what? No photo of Maryam? The photos are beautiful and the treats so delicious! Eid Mubarak to you and your family. Heartflet congratulations on your blog birthday and the amazing magazine feature. I absolutely love your blog. Thank you for this amazing giveaway. I subscribed to Sips and Spoonfuls by email. Thank you for all the great recipes and amazing photos! I just found your site through food gawker and love it! Thanks Sukaina, for preparing such a nice simple dessert.It looks attractive & easy to cook. Anybody can easily prepare this dessert with in 15-20 minutes.I prepared this wonderful dessert for my guest.They appreciated me for providing this tasty dish. 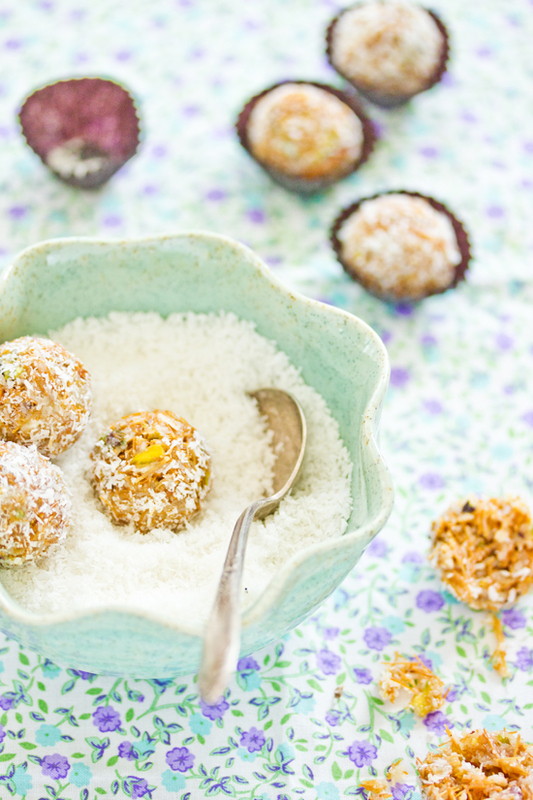 Very colourful Nutty Coconut Vermicelli Truffles. Thank you Sukaina, for the great Eid treat. Your lovely blog posts are firing up my RSS feed on Google reader! I am on your mailing list..sns dropped a mail..yeah! 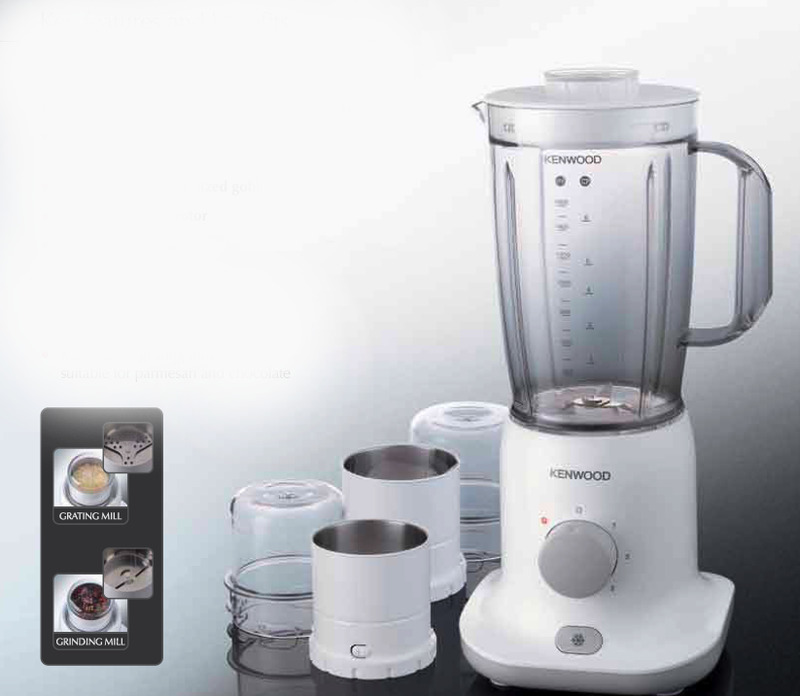 I am already fan of Kenwood FB & Tweet. Liked Sips and Spoonfuls on facebook too. liked Kenwood Middle East on Facebook loonnnggg back ! Following Kenwood ME on Twitter! Liked Kenwood ME on facebook. What a gorgeous post! I'm already enjoying this blog immensely, even though I've only just been introduced to it and you, and I can see that you have an admirable combination of skills and passion. I love your description of experiencing Eid and what it can mean in the family and the larger community both. And that's what food and all of the other great blessings in our lives should always serve to do, and why I love holidays and special occasions that allow us to explore that fully! Thank you for sharing! I am already following your blog via email. You have a lovely blog. Do include me in your giveaway. Man, im baffled on the way to have the workout strategy thing. Can u clarify how to get it? hi...even i'm a Herbalife distributor and i am utilizing Herbalife for your past four months..i have lost six kgs.I'm intending to conceive . .My utmost fear is...will i face any troubles in conception when employing herbalife? The Machinist then you should do. It's a outstanding movie. a lot of them imprisoned for daily life? women look for him out to get a relationship and possible marriage. drastic way by an imprisoned man, much more than a totally free guy? techniques to your won website. I have fun with, result in I discovered exactly what I used to be looking for. Have to be on some sort of payroll and are here to by some means persuade those that are "in the know" Or "awake" as they call on their own, to overlook what they have "learned" on youtube and also other blogs. up! It's hilarious! I wish the makers of this web site would produce some video clips to clarify this stuff in a graphical form. These men and women "learn" that chemtrails are "real" by means of youtube, perhaps somebody will help them learn the actual information through youtube. I do not have the enhancing abilities but I do have some concepts for a movie. If anybody is interested, please contact me, DiSiNf0aGeNt (whatever they get in touch with me) on youtube. This is my first time i visit here. I found so many interesting stuff in your blog especially its discussion. From the tons of comments on your articles, I guess I am not the only one having all the enjoyment here keep up the good work. I acknowledge the same best work from you at some point or an alternate later. After reading your article I was amazed. I know that you explain it very well. And I hope that other readers will also experience how I feel after reading your article. I feel very grateful that I read this. It is very helpful and very informative and I really learned a lot from it. Terrific way of expressing those things in your post. Clear cut meanings. Good information here. I really enjoy reading them every day. I've learned a lot from them.Thanks so much for sharing this information. Greatly help me being a newbie. It is nice to read the information provided in your blog and i like this information because it is based on reality and i like this information. And it provides knowledge and useful information to the visitors of this site and i would like to visit this site again. Attractive info. Thanks, I am really impressed with the quality of what you have provided in your article. Wow wonderful post you have shared here Thanks a lot. I am writing a research paper and collecting information on this topic. Your post is one of the better that I have read. So well explained incredible article, any buddy can follow it, thanks and keep up the great work. I appreciate you for your great sharing keep it up.